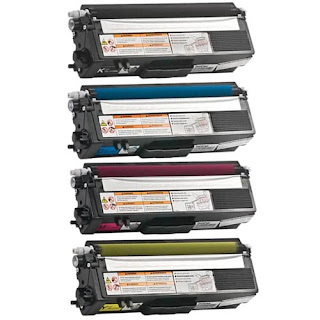 Most of small businesses that own the Brother MFC-8480DN or the MFC-8890DW are familiar with the need to replace toners and drums every once in a while. 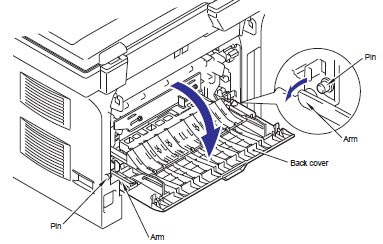 The fuser, on the other hand, is another essential part of the printer that many of our customers do not know how to replace or do not know that they need to replace the fuser until the warning message start to appear. The fuser is the part that heats the toner and fuse the powder in place to produce the final print out. The part only needs to be replaced about every 100,000 pages and it can be years for most business to see the warning message appear on their screen. 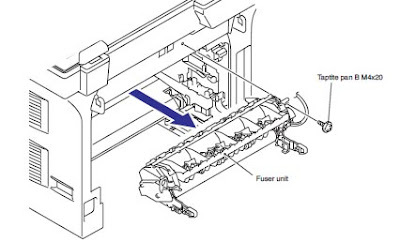 Because not many people are familiar with the fuser, we would like to share detailed instructions with you on how to reset the counter and replace the fuser. 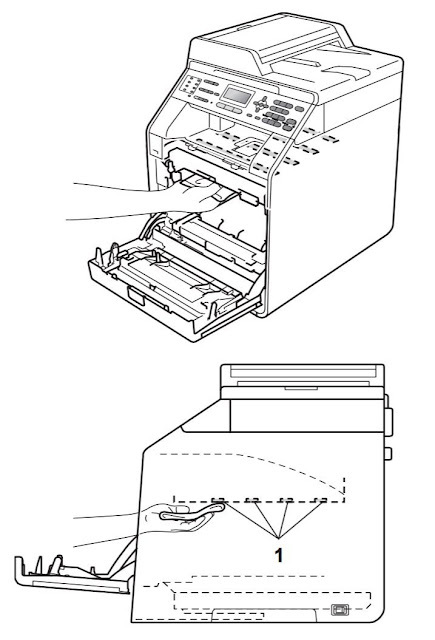 You can choose to reset the fuser counter if you feel like the print outs are doing okay and really do not need to replace the part until toner powder start to smear off from your final print out. 4. The screen will display (1) Reset (2) Exit. Press 1 to reset. 5. The machine will display ACCEPTED and go back to ready state. · Make sure that the AC cord is disconnected from the machine. 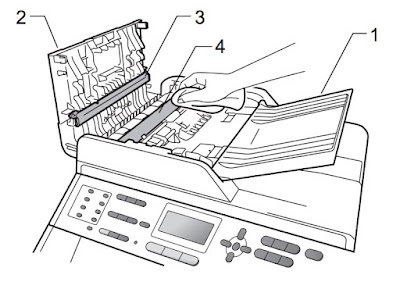 · Make sure that the drum and toner parts are removed. 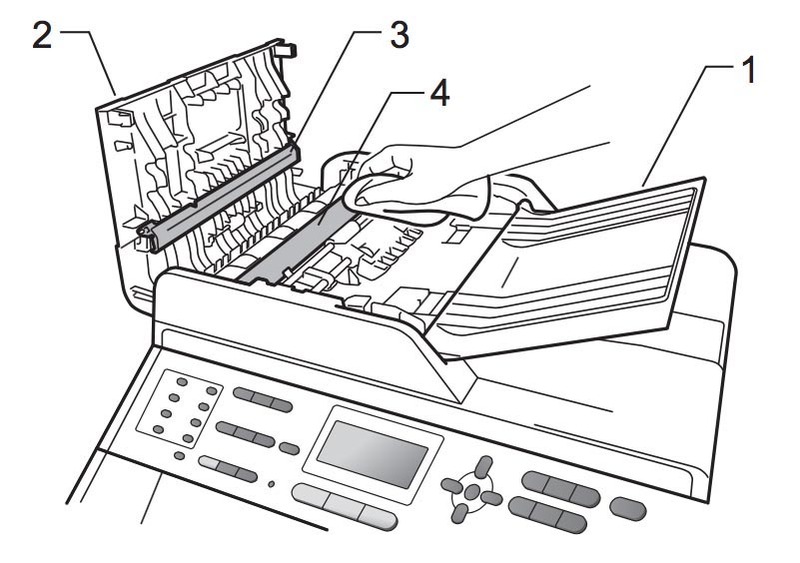 · Make sure that all the paper is removed from the Paper tray. 2. Remove the Arms of the Back cover from the Pins. 3. Remove the Pins of the Outer chute ASSY from the Back cover. 4. Remove the Back cover. 5. Hold the Knobs on the Rear chute ASSY and pull down this to your side. 6. 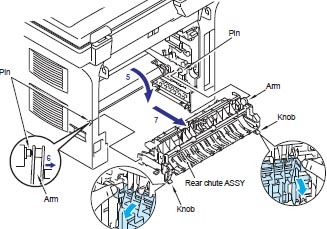 Remove the Arms of the Rear chute ASSY from the Pins. 7. Remove the Rear chute ASSY. 8. 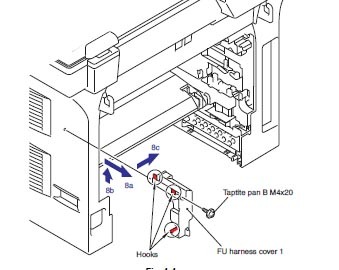 Remove the pan B M4x20 Taptite screw as shown on the picture below. Release the Hooks in the order of 8a, 8b, and 8c. 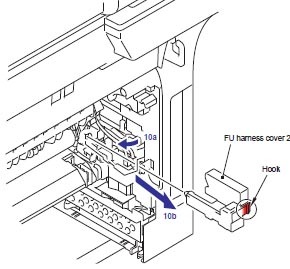 Remove the FU Harness Cover 1. 9. 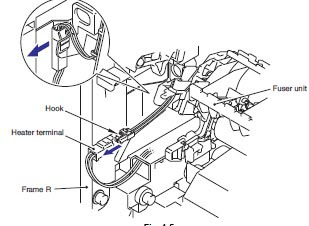 Disconnect the connector of the Heater terminal while pressing the Hook of the connector of the fuser unit. 10. Pull the FU harness cover 2 to the direction of 10a while pressing the Hook and pull out the FU harness cover 2 from the back of the machine. 11. 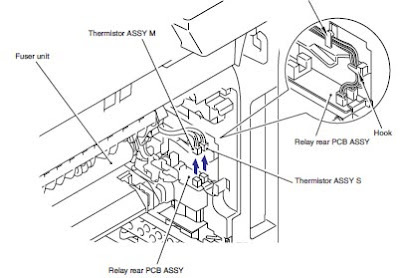 Disconnect the connectors of the Thermistor ASSY M and Thermistor ASSY S from the Relay rear PCB ASSY, and remove the harnesses of these thermistors. 12. Remove the pan B M4x20 Taptite screw to remove the Fuser unit. 13. Reverse the steps with your new fuser unit and viola! As you can tell from this post, changing out the fuser unit is a lot more complicated that replacing the toners and drums. If you do not feel completely up to it, it is advised to have a professional come and help you. However, we hope that this post will be able to help those of you out there that are technically savvy to save some service money. Once again, we would like to remind you that we will be more than happy to answer other technical inquiries you might have for your current printer. Please simply email us at sales@toner-spot.com and we will try out best to serve you. 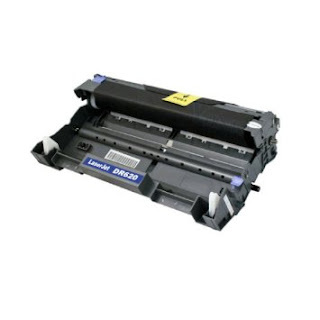 We also carry all the parts for the Brother MFC-8480DN and MFC-8890DW as well as most of the printing supplies and parts for major printer brands. 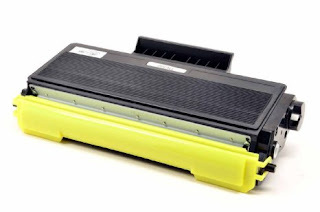 Please visit us at www.toner-spot.com to view our full selection and prices. For a sturdy and reliable printer like the Brother MFC-9560CDW, it’s not often that you would run into print quality issues. 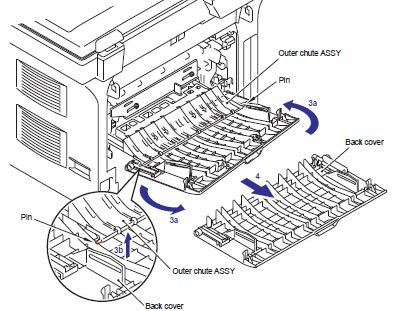 If print quality issues do occur, more often than not, the issues are the results of your toners or drum failing. However, we would like to point out that this might not always be the case and you could be throwing away perfectly good parts and replacing them without resolving the problem. We have recently received a call from one of our customers complaining about thick black lines on his copies. He has tried to replace the toner cartridges and the drum to no avail. After our technician spoke with him, we found out that the black lines were only happening when he tries to make a copy or scan documents, but the normal printouts from his computer were perfectly fine. The problem became obvious that all he needed to do was to perform some routine cleaning maintenance on his machine and there was no need to spend extra money to replace his existing toners and drum. He could have saved a lot of money! 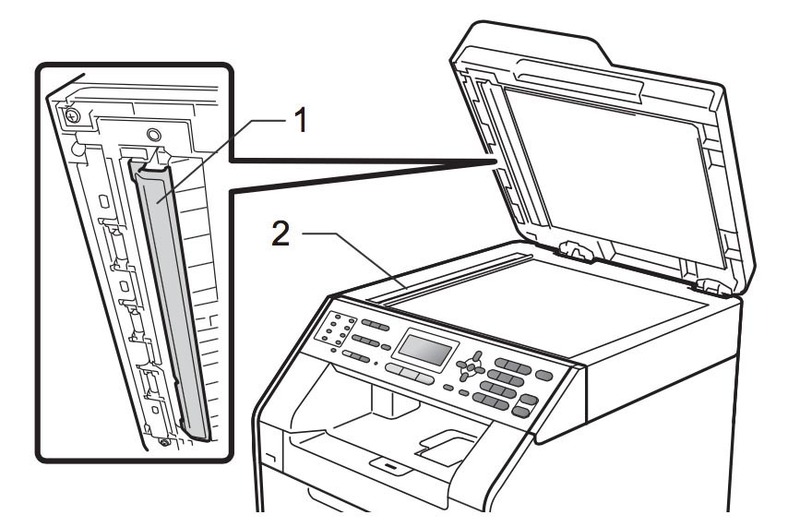 We decided that we will share this experience and provide a guide to perform cleaning maintenance for Brother MFC-9560CDW printer so that we might be able to help another person save some money. 1. Turn off the machine’s power switch. Unplug the telephone line cord first, disconnect all cables, and then unplug the power cord from the power outlet. 2. Unfold the ADF document support (1) and then open the ADF cover (2). Clean the white bar (3) and the scanner glass strip (4) underneath it with a soft lint-free cloth moistened with water. Close the ADF cover and fold the ADF document support. 3. Lift the document cover (1). 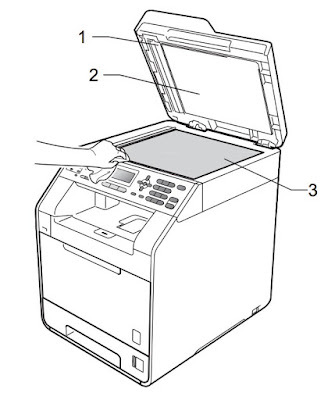 Clean the white plastic surface (2) and scanner glass (3) with the cloth. 4. In the ADF unit, clean the white bar (1) and the glass strip (2) underneath it with the lint-free soft cloth moistened with water. 5. Reconnect and plug your machine and turn the power back on. 3. Remove the drum unit. 4. 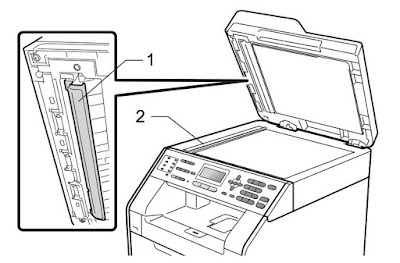 Wipe the four scanner windows (1) as shown in the pictures below with a dry, lint-free cloth. 5. Put the drum unit back in and close the front cover. We hope that you found this post to be helpful and we want you to know that we welcome any questions that you may have. We will try to help you to the best of our abilities. Please simply email us at sales@toner-spot.com with your inquiries and we will try to answer them as soon as possible. We would also like to remind you that we not only carry the printing supplies and parts for the Brother MFC-9560CDW printer, but also carry a full line of printing supplies and parts for most of the printers on the market. Please visit us at www.toner-spot.com for our full selection and our current promotions.